Barrel Color : Choose from the selection shown (wrapped barrel). 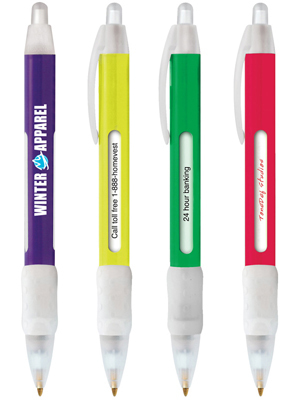 All pens include frosted clear clear grip, clip and section and white rotating tube. 6 lines of 1-color typeset copy. Approximately 40 characters per line, including spaces, the less characters, the larger the imprint. Imprint Area: 2 7/8" x 3/8"
Imprints on BIC WideBody Message Pen Colors are printed with 4-color process inks, as opposed to spot color inks. Imprints on this pen may have a slightly translucent finish. 1 We Appreciate Your Business. 2 Our Customers Are #1! 4 Service Excellence. 5 Congratulations! Imprints will default to Snell or Times font unless otherwise specified. Please reference stock message number on order. Standard - 13 lbs. (approx.) @ 500 per carton. Special packaging (click here).